Our July 21 eco-cruise on the Hackensack River and nearby marshes has been postponed because of a possibility of thundershowers. The pontoon-boat cruise has been rescheduled for Wednesday, July 28, at 5:30 p.m., and some openings have been created by the postponement. For details or to make a reservation, call the NJMC's Gabrielle Bennett-Meany at 201-460-4640. Click here to see a list of the birds we saw on a similar cruise on Tuesday morning. 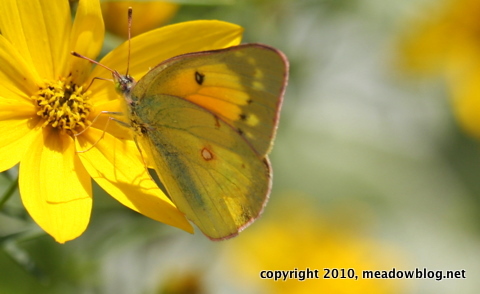 We are keeping our fingers crossed for nice skies and not too much humidity for Butterfly Day at DeKorte Park today. The free event begins at 10 a.m. and ends at 3 p.m. — come and go as you please. Short slide shows begin at 10 minutes after every hour; butterfly walks begin at 10:30, 11:30, 12:30, 1:30 and 2:30. Bring your own food and beverages. Let's hope the butterflies cooperate! Because parking may be at a premium on Sunday , we are reserving the parking lot nearest the guardhouse for people attending Butterfly Day. All other park users, including birders and walkers, are asked to park in the lot by the Administration Building and observatory until after 3 p.m.
We ask all drivers to drive slowly and to look out for pedestrians. Thank you. For last-minute information, you can call the NJMC's cellphone, 201-615-8570 or 201-469-7349. We've compiled a list of the birds we saw on our pontoon-boat birding trip on Tuesday. 32 species, including eight Ospreys and quite a few Yellow-crowned Night Herons — and we're sure we must have missed a few species because we weren't really looking for Northern Cardinals, American Robins, etc. Not too shabby. 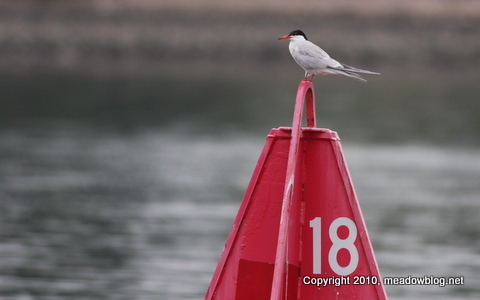 One of our umpteen Forster's Terns is pictured above. 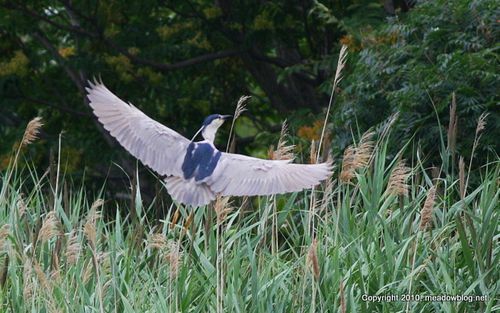 Black-crowned Night Heron is below. We have a great schedule for this Sunday's Butterfly Day at DeKorte — with walks, talks, activities for kids and great door prizes. It's perfect for families, and it's free. The event runs from 10 a.m. to 3 p.m. Just bring your own lunch and beverages. The event is sponsored by the New Jersey Meadowlands Commission, the Bergen County Audubon Society and the Northern NJ Chapter of the North American Butterfly Association.